Experience the beauty of guitars in harmony in a program of jazz, pop and contemporary classical works for guitar ensemble. Leading guitar teacher John Mostyn directs the Strumalicious guitar ensemble at the Con. Participation in Strumalicious is by application and audition. Also, make sure you check our other ensembles. 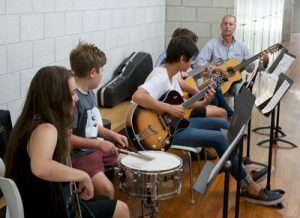 We have many options for Coffs Harbour musicians who would like to join a band (including Coffs Con Studio Band, Youth Orchestra, The Academy, etc).